For small business owners looking to offer “voluntary” wellness programs on a limited budget, look no further than your employee benefits packages. Most employees do not utilize their benefits to their full potential. Motivating and incentivizing your employees to use the benefits that are already provided can be a great way to launch a wellness program. Insurance carriers provide preventive screening schedules that can be used to guide your employees to seek regular medical check-ups at no cost to them. Utilizing the schedule can help employees take control of their health and potentially prevent catastrophic health events before they occur. Several carriers offer great discount programs on top national brands to make living a healthy lifestyle more fun and affordable. Discounts include gym memberships, weight loss programs, tobacco cessation resources, gym apparel and equipment, and other fitness and nutrition resources. Utilizing local and national resources is also a great way to educate employees on good, healthy behaviors at a limited cost. Organizations such as the American Heart Association and the U.S. Centers for Disease Control offer free, online education resources and information tool kits. Local organizations may have access to grants that can help offset the costs of tobacco cessation and nutrition programming. Local chapters may even offer onsite lunch and learns and be willing to participate in your company health fair. Small business owners do not have to offer large cash prizes in order to motivate employees to participate in the wellness programming. Setting up challenges where individuals or teams compete to earn a top prize can be a great way to utilize the natural competitive side of your employees while offering a supportive culture. 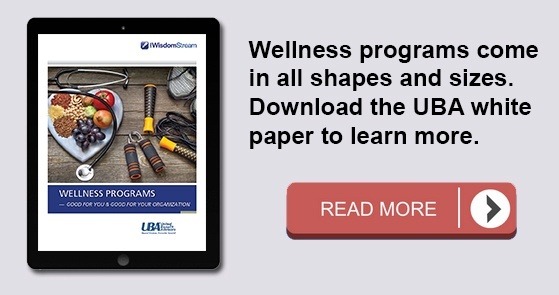 To understand legal requirements for wellness programs, particularly as it relates to incentives, request UBA’s ACA Advisor, “Understanding Wellness Programs and Their Legal Requirements,” which reviews the five most critical questions that wellness program sponsors should ask and work through to determine the obligations of their wellness program under the ACA, HIPAA, ADA, GINA, and ERISA, as well as considerations for wellness programs that involve tobacco use in any way. Employees can have their passport stamped as they visit with providers and participate in organizational events. Wellness Committees have found success in offering raffle tickets for each completed item and offering drawings for wellness-related prizes at a company picnic or end of year holiday party. Additionally, a point value can be used and participants can earn points to be in a drawing for achieving gold, silver or bronze status. To ensure your program produces real culture change over time, consult these six steps to a successful, sustainable workplace program. Small business owners do not have to break the bank to offer their employees great wellness programs. Take a look at what is offered through your current benefits and educate your employees on how to take full advantage of what they offer. Do not be afraid to reach out to local organizations to see what kind of free or low-cost programming is available.